Sorry. Video is not available for this recipe. Inspired by the lovely Sal and my Melbournian Greek-at-heart friend Kate and her mate George. You could substitute in ground coriander seeds – I was just being a little lazy. And buttery Sicilian olives would be my pick. Serve on a bed of wilted greens such as spinach or silverbeet and if you’re feeling up for it, some spuds roasted with rosemary & garlic – preferably in duck fat. So good. Next time I’d double the recipe and cook 2 shoulders at once. The best leftovers ever – thinking a lamb sandwich with chutney & rocket, or a lamb ragu with pasta or even a filling for a decadent pot pie. Trust me, you won’t have any problems getting rid of the lamb. And I wasn’t kidding about the 360 minutes. You’re going to need a whole 6 hours for this dish but it only takes 10 minutes of active cooking time. The rest is letting the slow oven work its magic while you get on with your day. Preheat oven to 170C or 340F (if your oven is fan forced reduce the heat to 150C / 300F). Place sliced lemons in the base of a cast iron pot or casserole dish large enough to hold the lamb snugly. Add 1/2C water. Rub lamb with olive oil, salt & pepper and place on top of the lemons. Sprinkle over coriander seeds and cover tightly with foil and a lid – if you have one. Bake for 3 hours. Reduce heat by 20C / 40F and cook for another 3 hours or until lamb can literally be cut with a spoon. Keep warm. When you’re ready to serve pop the feta an olives in with the lamb and bring to a simmer on the stove top. 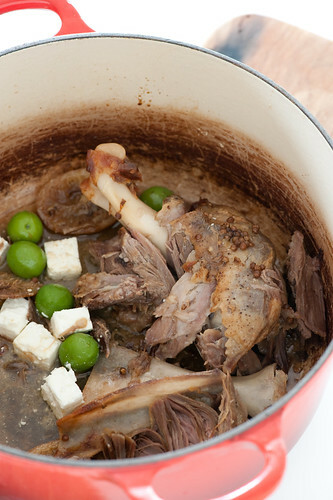 Shred lamb from the bone and serve with the lemony pan juices topped with the feta and olives. Cooked this tonight. Tried in the oven as it was a cold day. Too lemony for me. Were you supposed to lift the lamb out of the lemon juice at the end, then add the feta and olives? Very tart dish and the green olives seemed to add to the tartness. Lamb cooked well and falling of the bone. I will have to try one of the other lamb dishes instead. Sorry the lamb was too lemony, I’m wondering if you had particularly acidic lemons? I just serve the lamb with the sauce and I love how the lemon cuts through the richness of the lamb. Just thinking you could skip the lemon next time or halve it. Fat or oil will tame the acidity and balance it out, so stirring in some butter or cream with the juices would help. Does this work in a slow cooker. I have a small kitchen, not really keen on leaving the oven for six hours. Otherwise, instead of keeping warm, could you cook the day before and reheat the next putting in the feta and olives. Absolutely Denise… just halve the amount of water you add.